Pindar's Pythian Eleven is a miniature masterpiece: a poem praising a young athlete which presents a vivid and important account of the Agamemnon legend. Yet it contains so many difficulties (of text, metre, dating and interpretation) that even Wilamowitz regarded it as one of Pindar's most obscure poems. This 2007 edition (the first full-scale treatment that the poem had ever received) provides answers to the problems that have prevented proper appreciation of the work. In addition to the full introduction and commentary, the book also has a text based on re-examination of the manuscripts, detailed metrical discussion, and a translation. Preface; Introduction; Metrical analysis; Testimonia; Synopsis of readings; Text, translation and apparatus; Commentary. 'For any scholar working on Pythian 11 in the future, Finglass's careful contribution will be an essential starting point ... The commentary is erudite and extensive.' Thomas Hubbard, Classical World 'The commentary is excellent.' Douglas Gerber, New England Classical Journal 'Finglass's edition provides a welcome new basis for researchers and interested readers who have been, or will be, engaged with Pindar and his Eleventh Pythian Ode.' Orlando Poltera, Gnomon 'Thorough and thoughtful ... the book will certainly be the indispensable standard introduction, text, and commentary on the ode for some time to come.' Christopher Eckermann, Mnemosyne 'The commentary ... is very detailed, intelligent, and expert, and I am convinced that many readers of this poem, which is so full of problems, will derive from it value and instruction.' Giambattista D'Alessio, Exemplaria Classica 'Finglass's work deserves praise and appreciation ... this commentary is extremely useful and well documented.' Carlo Lucarini, Rivista di Filologia e di Istruzione Classica "The commentary is excellent ..."
New England Classical Journal "For any scholar working on Pythian 11 in the future, Finglass' careful contribution will be an essential starting point ... The commentary is erudite and extensive." 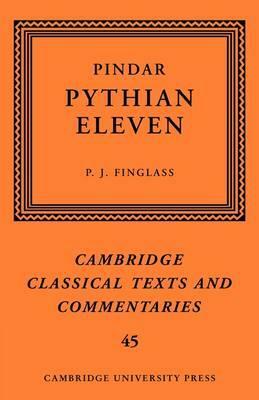 Classical World "Finglass's edition provides a welcome new basis for researchers and interested readers who have been, or will be, engaged with Pindar and his Eleventh Pythian Ode." Orlando Poltera, Gnomon "Thorough and thoughtful ... the book will certainly be the indispensable standard introduction, text, and commentary on the ode for some time to come." Christopher Eckermann, Mnemosyne "The commentary ... is very detailed, intelligent, and expert, and I am convinced that many readers of this poem, which is so full of problems, will derive from it value and instruction." Giambattista D'Alessio, Exemplaria Classica "Finglass's work deserves praise and appreciation ... this commentary is extremely useful and well documented."